This is a guest post by Harry Mercer. This is a very technical description – read on if you are technically oriented.. Here are given some important dyeing processes related to indigo dyeing – specially on Rope Dyeing . Cotton fibers contain impurities like waxes, pectins and minerals that will interfere with Indigo dyeing and result in streaks.-Sodium hydroxide at low concentrations (<5%) are applied at high temperatures (>85 C) in order to remove impurities and melt natural cotton waxes. Causticizing generally refers to using sodium hydroxide at below Mercerizing concentrations (<18%). Cold causticizing of cotton yarn results infaster Indigo dye fading from laundryabrasion, darker Indigo color with the same % of Indigo and unique washdowns. Mercerizing is the use of strong sodium hydroxide (18-30%) to swell surface fibers. When using strong sodium hydroxide it is important to remove all of it. If sodium hydroxide is on the yarn as it enters the Indigo tanks, the yarn color will change. Concentrations of sodium hydroxide more than 18% are not a solution, but a gel and are difficult to remove. Mercerized yarns are more ring-dyed and dye more darkly than non-Mercerized. Mercerizing is normally conducted at low temperatures, but hot Mercerizing can be employed for a more abraded appearance after garment laundering. Indigo dyeing is unique and because of the complex chemical reactions should be correctly viewed a a form of chemical engineering. Only Indigo dyeing requires multiple dye applications for a dark shade. Color consistency of Indigo in recent decades has been unsatisfactory as a result of machine designs that do not apply basic principles of fluid mechanics properly and unstable dye mixes. Commonly, a single dye lot will have between 8 and 15 visually different shades from beginning to end and also have shade differences from one side to the other. Indigo dyeing follows the same basic steps regardless of machine design. washing tanks, dyeing(1-20),a heated tank for topping (optional) and wash tanks. In different areas of the world,the same color is produced using 1.8, 2.0 or 4% Indigo depending on dyeing method. Stock Mix 80 g/l Indigo Pure 100 g/l 50% Caustic 70 g/l Hydro powder. This was an example of a typical method used in the U.S. for a very dark shade. In order to produce the same depth of color as 1.2% in the U.S., in Latin America 2.0% is used and in Asia from 2.4 to 2.8%. The U.S. method results in more surface (ring dyeing), which loses color faster. Very dark shades of Indigo are in demand currently around the world. Many companies use 4% or more Indigo on weight of yarn, which is expensive. For dark Indigo that does not lose color 2% applied normally, with an Indigo bottom. Dyeing Indigo in light shades results in a sky-blue impossible with any other dye. This is useful for shirting fabrics that are not strong enough for stonewashing, bleaching or cellulase treaments. Special procedures are necessary in order to avoid colorfastness problems. The typical methods used for dyeing sulfur bottoms result in denim shade differences. If dextrin reducing agents are used, which require 85 C, there will be variation. Sulfur bottoms are an exception to the normal pH for sulfurs(11), requiring 12. In topping the sulfur dye is applied after the Indigo dyeing. Sulfur topping permits much darker color than a sulfur bottom, but is duller. Sulfur topping colors include black, blue-black, yellow brown and green. Sulfur toppings are used to produce slub appearances in normal yarn. 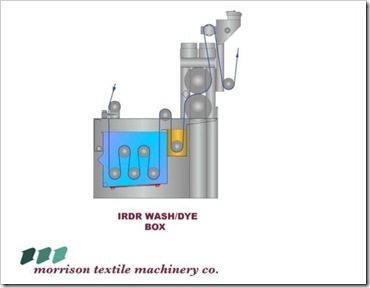 Reactive dyes can be applied on specially-Designed Indigo machines. Small 150 liter boxes are inserted inside the larger dye tanks for Indigo and sulfur. Steamers, drying units near the front of the machine and high-quality dye padders are required for quality dyeing. Indigo and sulfurs are types of vat dyes. In non-denim cotton dyeing, another class of vats, anthaquinoids are used to produce a full range of colors that are colorfast. Some of these vat dyes can be blended with Indigo or applied using standard procedures on specially designed machines. The Indigo dyeing process begins with a concentrated mixture of Indigo, sodium hydroxide and reducing agent. This concentrated mixture (70-90 g/L Indigo) is delivered by pipes to the Indigo dye tanks where the dye concentration is reduced to 1-4 g/L for dyeing the cotton. Many denim companies find it difficult to control original and washed Indigo shades. The primary source of color differences is the instability and inconsistency of Indigo mixtures. As the concentration of reducing agent going to the dye machine changes, the color changes. For consistent Indigo dyeing, the mixture must have consistent concentrations of Indigo, sodium hydroxide and reducer from the top of the mixture to the bottom. The main cause of inconsistent Indigo mixtures relates to concentration levels. Instability of Indigo mixtures results from the decomposition of sodium hydrosulfite. There is a limit to the amount of any chemical that can be dissolved in water. When the limit of solubility of any chemical •In water is exceeded, precipitation occurs. Indigo mixes should not have more than 20% solids. At higher levels, chemicals and dye sink to the bottom of the tank. When reducing agent sinks to the bottom of the tank, there is a higher concentration than in the top of the tank. As the dye enters the machine, the higher concentration results in a lighter, greenercolor and as the dye from the top of the tank enters the machine, the color is darker and redder. Stirring the tank for 2 minutes will improve dye uniformity between top and bottom. To avoid settling of dye and chemicals the total solids should not exceed 20%. The “glass plate” test can be used to test concentrations of hydrosulfite in the top and bottom. If dye requires 50 seconds to oxidize, there is about 50 g/L of reducer. Alkaline buffers have been used to make very dark shades of Indigo with as little as 1% dye, more ring-dyed, faster fading. Reductive buffers can eliminate color differences in Indigo-dyed denims and can reduce hydrosulfite use by 30-50%. Sulfur colors can be dyed at low temperatures with specific buffers which produce more colorfast dyeings with no color variation. Cold dyeing methods have been used to blend Indigo and sulfurs, eliminating the need for separate bottoming and topping, while eliminating shade changes in both. On rope ranges, space dyeing techniques can be simple and produce a wide range of special effects in denim. By dyeing part of the yarns with a sulfur top and leaving the rest un-dyed, many companies produce a slub appearance with regular yarns. Blending ring yarns of different sizes also produces a slub appearance.